Splitting dinitrogen is not easy. Although nature is very efficient in converting nitrogen to ammonia in nitrogen fixation humans can only do it in a crude high temperature high pressure method called the Haber process. Finding a catalyst that will do the job with moderate reaction conditions must be one of the holy grails in chemistry. And profitable: ammonia itself is the raw material for the production of fertilizers critical to agriculture. The first to try successfully was Richard R. Schrock in 2003 (DOI) with a molybdenum system although with a lousy turnover number of 8. The latest system described by Knobloch, Lobkovsky and Chirik (DOI) is not even catalytic but manages to combine nitrogen and carbon monoxide to form oxamide which is a fertilizer in itself. Thus hafnocene 1 is reacted with nitrogen and sodium amalgam to dinitrogen complex 2. It takes 6 electrons to reduce dinitrogen and 2 are supplied by each hafnium center. The nitrogen center can be considered a N24- ligand. 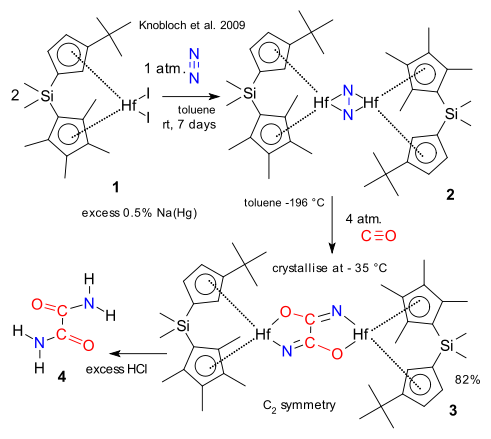 The two remaining electrons are donated by CO in the next step to intermediate 3 and treatment with hydrochloric acid liberates oxamide. The ambient temperature claim in the article summary however is somewhat optimistic: sure the nitrogen adduct product is formed at 25 °C but addition of CO takes place at - 196°C. The process stops at higher temperatures because then hafnium misbehaves and inserts itself in one of the t-butyl C-H bonds rather then allowing CO insertion. Update 02-01-2010: switched to Cp ligands in image. Many thanks to vigilant reader S.